(Chris Detrick | The Salt Lake Tribune) The Provo City royalty wave to the crowd during the annual Freedom Festival Grand Parade in downtown Provo Tuesday, July 4, 2017. Call it the Freedumb Festival. America’s Freedom Festival, Utah’s largest celebration of the nation’s 18th century beginnings, is going kicking and screaming into the 21st century. After first thinking they could feign anti-discrimination and still cut out LGBT representation, the people behind Provo’s annual Fourth of July parade now are offering to let LGBT groups re-apply to join the parade. Parade organizers’ first defense for denying the groups — they were “deemed outside the parameters of the parade guidelines” — crumbled in less than a day. A Utah County commissioner threatened to pull their public money (yes, this is taxpayer supported), and festival organizers later put out a statement saying the denied groups can re-apply for admittance. The parade folks thought they had a smokescreen. 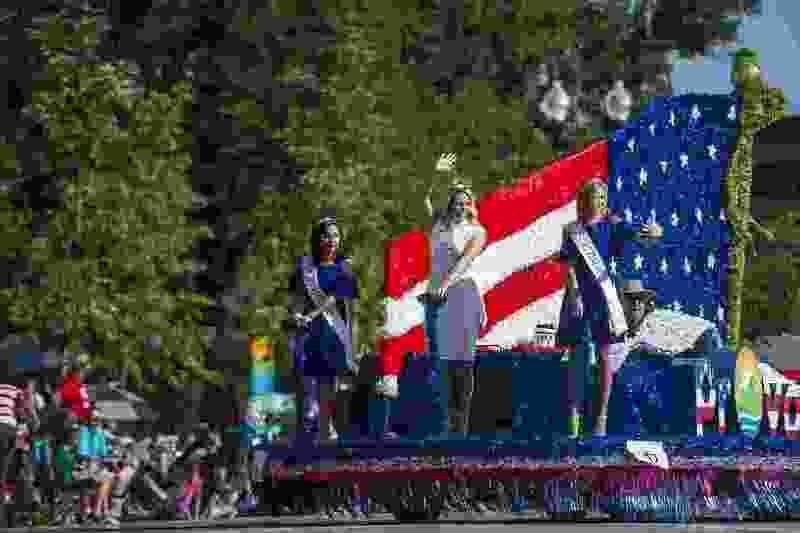 On the same day they were rejecting parade entries, Provo’s mayor was heralding the city’s new contract with festival organizers that included an anti-discrimination clause. Most galling was the rejection of Encircle, the group that was allowed in last year only to be turned away at the last minute. Encircle was created to discourage suicide among LGBT youth. This is not controversial. There is no political or religious group advocating for letting gay kids die, but the Freedom Festival leadership apparently decided the subject is unpatriotic. Just this week, well known freedom-loving American Sen. Orrin Hatch spoke about the need to protect vulnerable LGBT youth from taking their own lives. “These young people need us, and we desperately need them,” Hatch said on the floor of the U.S. Senate, a rather patriotic place. There’s another shoe to drop here, and it’s a cowboy boot. Mormons Building Bridges has been trying to march in the annual Days of ’47 Parade in Salt Lake City for four straight years. Unlike Provo, Days of ’47 doesn’t get direct public money, although it certainly gets plenty of accommodation and support from Salt Lake City government. Will the fifth time be the charm? We should celebrate our history, not relive it. These parade organizers think they can make time stand still, and they’re not even listening to their own children, to whom history’s unfairness is obvious. We’re eight years out from the nation’s 250th birthday on July 4, 2026. By then, there is no way the Freedom Festival is still trying this. It’s been a long fight for gay people to gain what the rest of America already had. Let’s hope someday we can laugh about parade organizers who yearned for a cruel past.